What is the best way of folding a straight chain alkane? I start with noting the use of a TZVP basis set. In a recent article we noted that the basis-set-superposition-errors for this basis were about a quarter of that for the standard Pople-type 6-311G(d,p) basis that I tend to use for modelling in this blog. This matters, since the relative energy of a folded-conformation vs an extended linear one might depend on the quality of the basis set and its inherent BSSE. The DFT method is the classical B3LYP. I also modelled C58H118 as the hydrocarbon as being well beyond the region anticipated above for folding of the chain to have started (no, there is no crystal structure). The geometries of linear and bent forms are shown below. The relative free energy of the V-shaped bent form emerges as 3.5 kcal/mol higher than the linear form. Now, to add a Grimme-D3 dispersion correction to the energies. The V-shape of the bent form now adopts the hairpin mode, and its energy is now 2.5 kcal/mol lower than the linear form. Note in the above the very slight strange oscillation (kink) that appears about 11 atoms away from the hairpin bend. I repeated this with the wB97XD DFT procedure (in which dispersion is implicit) and found the same result. As triple-ζ basis quality modelling of molecules with >100 atoms becomes increasingly common, it is worth repeating yet again that the model should always contain dispersion (and solvent if appropriate) corrections as default. Indeed, it is probably also worth re-investigating much early modelling (by this I mean modelling done ten or more years ago) to see if such corrections significantly influence the conclusions. ‡The searches cannot be carried out according to the formula CnH2n+2, but must be done individually for the value of n. I gave up at C50. This entry was posted on Saturday, March 29th, 2014 at 3:35 pm and is filed under General. You can follow any responses to this entry through the RSS 2.0 feed. You can leave a response, or trackback from your own site. 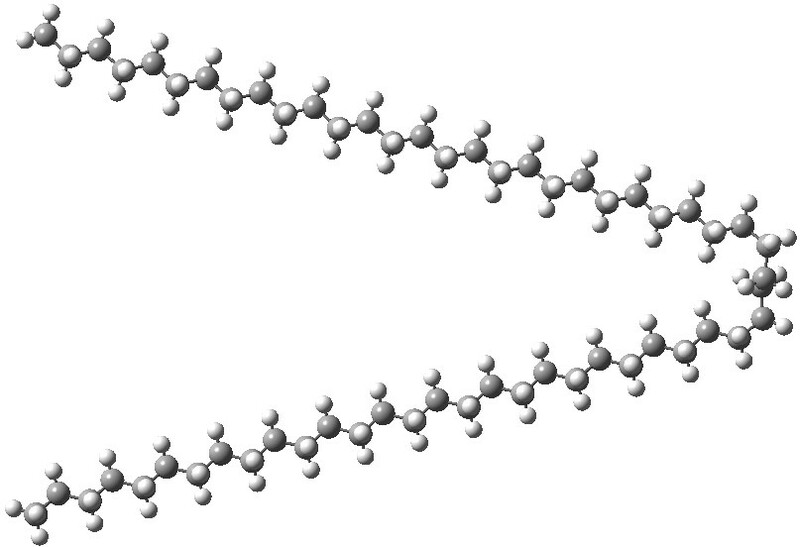 Modelling the geometry of unbranched alkanes. is licensed by Henry Rzepa under a Creative Commons Attribution-Noncommercial-Share Alike 3.0 United States License.